Avi Vantage user accounts can be enabled for super user access. Super user access provides write access to all resources within Avi Vantage, and also automatically provides access to all tenants. The admin account that is created during installation of the Avi Controller automatically has super user access enabled. Optionally, super user access can be enabled in other user accounts, on an individual basis. Note: Starting with Avi Vantage 17.1 release, a non-admin user (which is also a super-user) can be associated with the Avi Controller by using the attach <Avi Controller IP> command. This will provide Avi Controller container access to the user as an avidebuguser. The avidebuguser is also a sudo user. 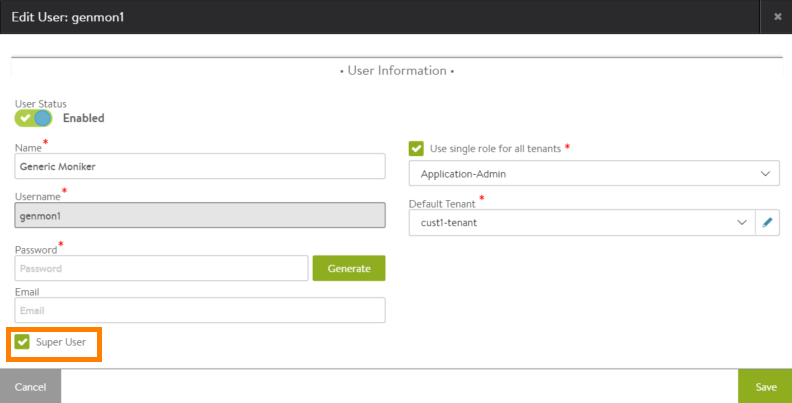 Attach option is available only if the user (local or remote) is configured as a super-user. For detailed information about configuring user accounts, click here.